In this article, we examine the challenges of using predictive maintenance in manufacturing and how preventive maintenance software can help facilities overcome these obstacles. So, what is predictive maintenance anyways? Predictive maintenance (PdM) uses software, data and human observation to predict when equipment failure might occur and prevent the failure by performing maintenance. While the concept has been around for decades, recent advancements in technology are making PdM more accurate and accessible to manufacturers. The buzz around PdM has many maintenance professionals setting their sights on implementing it at their facilities. However, establishing a successful predictive maintenance strategy is easier said than done. PdM requires an entire ecosystem of technology and a balance of other maintenance strategies to reach its full potential. Without a solid foundation, the substantial investments needed to establish PdM will be for nothing. While no amount of maintenance can make your equipment any younger, a digital preventive maintenance solution, like CMMS or EAM, can clarify where there is potential for technological upgrades and how your assets might handle this transition. This is where preventive maintenance (PM) comes in. Creating a healthy preventive maintenance strategy is crucial to building a framework for PdM to succeed. Preventive maintenance provides everyone in an organization with the tools necessary to help PdM reach its full potential, such as training, comfort with technology, an understanding of data, and a culture of total productive maintenance (TPM). While both preventive and predictive maintenance help avoid unplanned downtime by performing maintenance before equipment failure, the difference between the two is in the timing. Preventive maintenance is performed on a regular, predetermined schedule, whereas predictive maintenance is done only when needed. With preventive maintenance, equipment checks are triggered based on time, meter reading, or usage. Predictive maintenance software allows for equipment readings to be continually monitored so technicians know exactly when an asset should be repaired. In other words, PdM aims to cut down on the number of preventive maintenance tasks required to keep equipment running with minimal unplanned downtime. The ability to collect and analyze data to accurately predict failure patterns is crucial to a successful predictive maintenance strategy. A PdM strategy won’t last very long if predictive technologies can’t be used on critical assets or if no one can monitor, evaluate and act on the data. This is no small task. The first step is to evaluate equipment and ensure predictive maintenance software technology can capture data used to identify failure modes. Algorithms must be created to predict failures and outcomes. Data cleansing and mapping must be done and a plan put in place to constantly collect, monitor and analyze data. If all the steps above seems like a lot, you’re right, they are. However, a strong preventive maintenance strategy can ease the transition. A solid preventive maintenance strategy relies on data to inform decisions. Several maintenance metrics, like asset history and condition, can be tracked and analyzed using preventive maintenance software, such as a CMMS. For example, CMMS software can record standard failure codes, root cause analysis, temperatures, vibrations and more. Additionally, these measurements can be used to prepare reports, which are analyzed to determine preventive triggers and checks. All this lays a foundation for the more intensive data gathering and analysis required for a predictive maintenance program. Predictive maintenance can be expensive. A solid PdM setup requires a variety of different technologies to run efficiently. It may require significant investment to upgrade decades-old equipment with smart assets or to integrate predictive technology into these aging machines. And that’s if the technology even exists or is available for the type of measurements and assets you are trying to analyze. Even if your facility can bear the cost and installs the technology, the software, hardware, and algorithms that focus on PdM are still in the early stages of development compared with other maintenance solutions. All these considerations are enough to make your head spin but don’t worry, there’s hope in preventive maintenance. While no amount of maintenance can make your equipment any younger, a digital preventive maintenance solution, like CMMS or EAM, can clarify where there is potential for technological upgrades and how your assets might handle this transition. Familiarity with technology also allows your facility to evolve from simpler algorithms and data analysis to more complex monitoring with fewer growing pains. Lastly, preventive maintenance is a process that is often established over time. This slow approach to adoption can help your facility quickly put in place a pilot program to test, learn and scale a predictive maintenance program. Implementing an industrial predictive maintenance solution creates a need for new skill sets in order to build, monitor, analyze and maintain the system. For example, in-depth algorithms for predictive models need to be created, which requires data scientists, reliability engineers and other members of the team to work together. These skills are often hard to find and may require partnering with multiple outside providers. There also needs to be a willingness from all areas of the organization to embrace PdM strategies and methods, from operators and technicians to the C-suite. The list of skills, training and buy-in needed for a successful PdM implementation can be daunting. However, a great preventive maintenance strategy often requires the development of these components, which provides a solid base to build off. Having preventive maintenance software, such as a CMMS, familiarizes all parties with data capturing, monitoring and analysis. This shrinks the learning curve when transitioning to a predictive maintenance system. A CMMS, or similar PM software, also provides an easy way to track training and skills, so you know where you need help and who is willing to learn. Lastly, a preventive maintenance strategy matches up perfectly with total productive maintenance (TPM). TPM uses the skills of all employees, not just the maintenance team, to incorporate maintenance into the everyday performance of a facility. 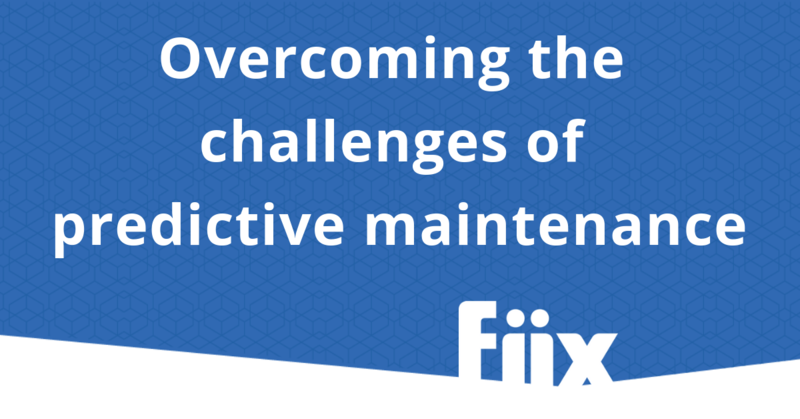 Once a preventive maintenance strategy is in place, TPM can quickly become a reality. Predictive maintenance can then flourish in this environment. There also needs to be a willingness from all areas of the organization to embrace PdM strategies and methods, from operators and technicians to the C-suite. Because predictive maintenance relies on tying together different assets and digital systems using cloud technology and the internet of things (IoT), it can require a heavy investment in protecting assets. This involves safeguarding access and adopting a proactive stance toward cybersecurity. Time, skill, effort and financial resources must all be available to ensure a facility’s predictive maintenance technology is safe and secure. Safeguarding data is a necessity when using any cloud-based preventive maintenance software. If your facility uses software, like a CMMS, it likely has a plan for cybersecurity already. If you do not use software, implementing a CMMS system allows your organization to start the process of safeguarding data and assets. Either way, a preventive maintenance strategy gives your maintenance team a chance to assess potential threats to data and prepare solutions. There are substantial benefits of predictive maintenance for any manufacturing facility, but there are many diverse elements to consider before a PdM strategy can be successful. Jumping into predictive maintenance is often detrimental to organizations that aren’t prepared for the massive investment in time, money and training that is required. Establishing a well-run preventive maintenance strategy cultivates the skills, processes and top-to-bottom buy-in that can help a facility overcome these challenges. At the end of the day, you’ll be glad you learned how to walk with preventive maintenance before you ran with predictive maintenance.